A presidential run may soon be on the horizon for Sen. Elizabeth Warren. "It's time for women to go to Washington and fix our broken government and that includes a woman at the top. So here's what I promise, after November 6 I will take a hard look at running for president," she declared to a standing ovation as seen in an online video. 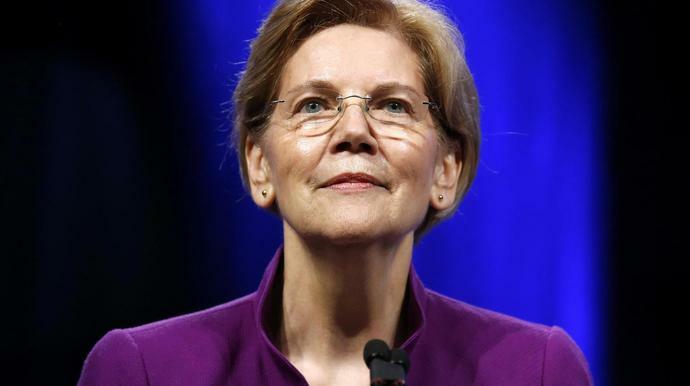 Warren, an outspoken critic of President Donald Trump who has said he intends to seek re-election, shared her plans at a town hall meeting in western Massachusetts. She expressed concern about the nation's general state of affairs and in particular decried Republicans' handling of sexual assault accusations against Supreme Court nominee Brett Kavanaugh. "I watched 11 men who were too chicken to ask a woman a single question," she said of the GOP members of the Senate Judiciary Committee who relied on outside attorney to question Kavanaugh's alleged victim, Christine Blasey Ford, at a hearing on Thursday. "I watched powerful men helping a powerful man make it to an even more powerful position." Of the president, Warren said, "Let's face it, Donald Trump is taking this country in the wrong direction ... I am worried, down to my bones, about what Donald Trump is doing to our democracy." Speculation over a presidential bid by Warren has swirled for some time. Her Saturday remarks were her clearest and most direct on her intentions. Warren, an Oklahoma native, won her Senate seat in 2012 after careers as a law professor and consumer advocate. She is currently seeking re-election to the Senate, and is heavily favored to defeat state Rep. Geoff Diehl.